BANGI, 30 Dec 2013 – Muslims needed to live Islam fully and not merely for personal gains said a former Chief of Justice of Malaysia, Tun Abdul Hamid Mohamad. Just because Islamic principles are being implemented, it do not mean that everything will be fine with the belief that Allah is on their side, Tun Abdul Hamid said speaking at the opening of the 10th International Conference on Tawhid and the World System here last week. The two day conference was organised by Islam Hadhari Institute (HADHARI) of The National University of Malaysia. 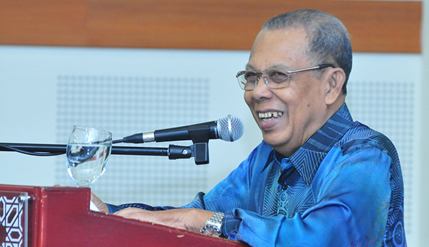 Tun Abdul Hamid who is also the adjunct Professor of Institute of Islam Hadhari (HADHARI) said, Tawhid in a nutshell is the awareness of God’s supremacy in every aspect of life. He said even the Muslim army led by the Prophet (peace be upon him) lost in the battle of Uhud, not because they had bad intentions or lacked faith, but because the archers disobeyed their orders when they vacated their positions to scramble for the spoils of war. He related that event with Islamic banking by people who chose it not out of piety but due to the benefits they could get. Thus a great number of Islamic Banking customers are non Muslims. They chose it because it do not charge interest, there is no penalty interests or other unnecessary charges. Islamic banking offer benefits that is lacking in the conventional system. However, he said, people can see the users true colours when they start to default. They would put up defense like their loans are not shariah compliant. He said for the Muslims who do this is just like a person who goes into restaurant, orders his food, eats it and when the bill comes he says that the food is not halal just to avoid having to pay. This do not happen only with the defaulters as some of the banks sometimes also use the same argument. They try to argue that the product that they offered was not Shariah compliant in order to renege on their commitments. He said “Certainly these people do not care about Tawhid (The oneness of Allah)” saying that any system is open to abuse. Tun Abdul Hamid urged Muslim not to merely use Islam as a brand that they can benefit from but use it as a matter of faith which calls for efficiency, honesty, discipline and hard work.